Vessel Plus 2017;1:91-5.10.20517/2574-1209.2017.08© 2017 OAE Publishing Inc.
Dr. Mariann Harangi is an Associate Professor at Department of Internal Medicine at University of Debrecen, Faculty of Medicine, Hungary. 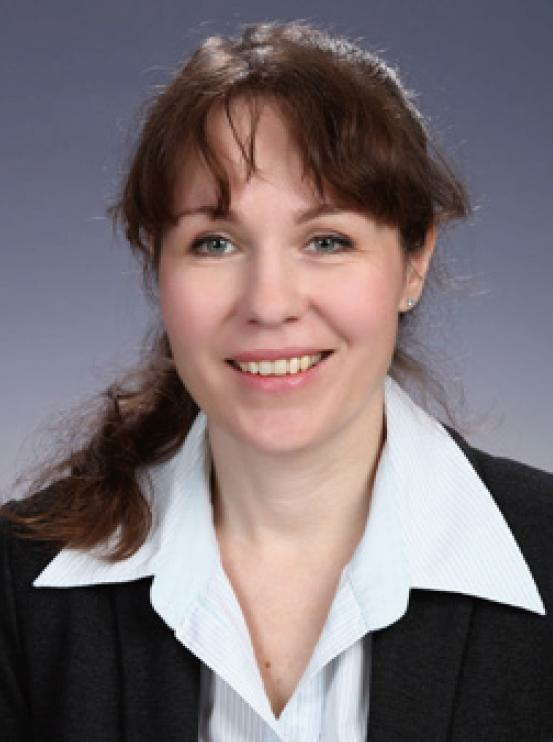 She is specialized in treatment of primary and secondary lipid disorders with particular focus on familial hypercholesterolemia and statin intolerance. She is the General Secretary of the Hungarian Atherosclerosis Society. Familial hypercholesterolemia (FH) is perhaps the most common single-gene variant causing premature morbidity and mortality. Heterozygous FH affects about 1 in 200 people. Genetic loci involved in FH phenotype include LDLR (low-density lipoprotein receptor), APOB (apolipoprotein B-100), and PCSK9 (proprotein convertase subtilisin/kexin type 9). The FH phenotype is based on family history, LDL cholesterol (LDL-C) levels, and presence of physical findings such as xanthomas, xanthelasma and corneal arcus. This allows for risk assessment and diagnosis when genetic testing is not available. Criteria that are most commonly used in the diagnosis of FH is the Dutch Lipid Network criteria. Genetic testing is critical for cascade screening and genetic counseling. Total cholesterol levels of 350-550 mg/dL (9-14.2 mmol/L) are typical of heterozygous FH while total cholesterol levels of 650-1,000 mg/dL (16.8-25.9 mmol/L) are typical of homozygous FH. In heterozygous patients LDL-C levels are usually > 190 mg/dL (> 4.9 mmol/L). In adults with homozygous FH, untreated LDL-C levels are generally, but not always, > 500 mg/dL (> 13 mmol/L). However, levels can be lower in children or in treated individuals. Thus, LDL-C levels are not sufficient to confirm a diagnosis. FH is associated with high risk of enhanced atherogenesis leading to the early development of coronary artery disease (CAD), carotid artery disease and peripheral artery disease. The European Atherosclerosis Society suggests LDL-C goals of less than 100 mg/dL (2.59 mmol/L) in all adults with FH, and less than 70 mg/dL (1.81 mmol/L) in adults with known CAD or diabetes mellitus. Therefore, there is an ardent need for an aggressive therapeutic intervention based on high dose statin or statin and ezetimibe administration, selective LDL-apheresis or newly developed further therapeutic strategies including the inhibition of PCSK9. LDL apheresis techniques are artificial extracorporeal methods for LDL-C elimination. There are various methods, including cascade filtration or lipid filtration, immunoadsorption, heparin-induced LDL precipitation, dextran sulfate LDL adsorption, and the LDL hemoperfusion. All of these techniques are effective and well tolerated. The constant reduction of cholesterol is meant, above all, to prevent the progression or the development of atherosclerosis. Human monoclonal antibodies against PCSK9: alirocumab and evolocumab have recently been approved by the Food and Drug Administration. These agents target and inactivate PCSK9, a hepatic protease that attaches and internalizes LDL receptors into lysosomes hence promoting their destruction. By preventing LDL receptor destruction, LDL-C levels can be lowered 50-60% above that achieved by statin therapy alone. Although the data are deficient, PCSK9 inhibitors may reduce the frequency or even eliminate the need for LDL apheresis therapy. A recent study reported that switching from LDL apheresis to evolocumab maintained the LDL-lowering effect but did not decrease high-density lipoprotein cholesterol (HDL-C) levels in three patients with heterozygous FH and coronary artery disease. Furthermore, findings from the ODYSSEY ESCAPE study suggest a role for alirocumab in the overall management of patients with heterozygous FH undergoing regular lipoprotein apheresis therapy, with the potential to avoid apheresis treatments or delay the requirement for such treatments. Here we demonstrate the efficacy of selective LDL apheresis, PCSK9 inhibitor evolocumab and the combination of the two treatment strategies in the case of a severe heterozygous FH patient. The 48-year-old female patient (body weight: 85 kg, height: 176 cm, body mass index: 27.4 kg/m2) with extremely high total cholesterol, LDL-C and lipoprotein(a) [Lp(a)] levels was treated by our Lipid ambulance. She had xanthelasmas on both eye lids [Figure 1], but neither xanthoma nor corneal arcus could be seen. Carotid artery ultrasound proved significant stenosis on both sides. Electrocardiography, echocardiography and exercise electrocardiography did not show the signs of CAD. Using the Dutch Lipid Network Criteria the diagnosis of FH is "probable". Sequencing of the LDL receptor gene we found a known pathogenic mutation in heterozygous form (c.1865 A>G, exon 13). Since the hypercholesterolemia, we found is unexpectedly severe in heterozygous FH, further genetic tests are in process. Although mildly elevated triglyceride (3.1 mmol/L) and lower HDL-C (1.1 mmol/L) levels are not usual in FH, the fact that the patient was overweight may explain this. Despite the maximum dose of combined treatment (rosuvastatin 40 mg/day, ezetimibe 10 mg/day, fenofibrate 267 mg/day), lipid levels were continuously high above the goals (total cholesterol 11.7 mmol/L, LDL-C 9.1 mmol/L). Therefore, we indicated the selective LDL apheresis treatment once a month (financially supported by the Hungarian National Health Insurance Company). We performed the treatments in the Extracorporeal Organ Replacement Center of University of Debrecen using the Direct Adsorption of Lipoproteins (DALI) system (Fresenius Medical Care). The DALI system can remove ApoB containing lipoproteins from the whole blood in one step without prior plasma separation. We used DALI 750 columns, 1:20 proportioned ACD-A (citrate solution) for anticoagulation. Average treated volume was 8,058 mL/treatment. The total cholesterol, LDL-C [Figure 2] and Lp(a) levels markedly decreased. During the first two treatments we observed mild and transient bradykinin reactions with hypotension, dyspnea, atypical chest pain and flushing. After three treatments apheresis was suspended for three months at the patient’s wish. Then, because of increasing lipid levels we continued apheresis treatment. Although between two treatments there was an increase in lipid levels, the time-average cholesterol (TAC) and LDL-cholesterol (TAL) levels calculated with a formula by Kroon et al. decreased significantly (TAC: 6.44 mmol/L, TAL: 4.68 mmol/L). Monthly apheresis treatment decreased TAC by 45.7% and TAL by 48.6%. The average reduction of Lp(a) level was 72%. Despite the efficacy of monthly apheresis treatments, lipid levels were still above the goals. Theoretically, we could increase the frequency of apheresis treatments and administer it biweekly, however, our insurance company would not support it because of its high costs. One of the two PCSK9 inhibitor monoclonal antibodies available in Hungary since 2015 is evolocumab. We decided to start this new agent added to the LDL apheresis treatment. Evolocumab was administrated biweekly, subcutaneously in a dose of 140 mg/day. After two months of combined apheresis plus PCSK9 inhibitor treatments we detected further significant reductions in total cholesterol and LDL-C levels (62.1% and 66.1%, respectively), and finally, we achieved the lipid goals. Hoping that the PCSK9 inhibitor treatment would be effective without further apheresis treatments, we stopped the apheresis and continued the evolocumab therapy. Unfortunately, despite the impressive efficacy of the PCSK9 inhibition, after a further three months the patient was above the goals [Figures 2 and 3]. Adequate treatment of patients with FH is a challenge and an everyday problem for the therapists. Combination of high dose oral lipid lowering agents is in some severe cases not effective enough because of the extremely high initial lipid levels. Our demonstrated case is a good example for this situation. Selective LDL apheresis treatments are available and widely used since the 80s. Removal of the ApoB containing lipoprotein particles can reduce the total cholesterol and LDL-C levels by 50-75% acutely. The TAC shows inter-individual differences and is usually between 20% to 40%. In our case the reduction was even higher. Moreover, LDL apheresis can markedly reduce the Lp(a) levels even by 60-80%. Lp(a) is an independent risk factor for cardiovascular disease and is not lowered by oral lipid-lowering therapy apart from nicotinic acid. In our case, LDL apheresis showed similar Lp(a) reduction. It must be noted that from the initiation of the apheresis treatments regular carotid ultrasound examinations did not show any progression and CAD was not diagnosed. One hundred and forty mg biweekly administrated evolocumab can reduce the LDL-C level by 66%. PCSK9 inhibition also results in significant (18-20%) reductions in plasma Lp(a). Unique efficacy of evolocumab in LDL-C reduction could be observed in our case. However, LDL apheresis treatment is superior in Lp(a) reduction. So, which treatment strategy should we choose in our severe heterozygous FH patients? Would selective LDL apheresis or PCSK9 inhibition be better? Decades of clinical experience, results of long-term follow-up studies[16,17] and unique Lp(a) reducing efficacy supports selective LDL apheresis. Furthermore, LDL apheresis treatment significantly improves the oxidative, inflammatory, rheological and hemostasis status of the treated patients. Nevertheless, superior efficacy of PCSK9 inhibitors in LDL-C reduction is in its favor. Both treatment options are well tolerated and safe, even in combination as was demonstrated in our case. It must be noted that further observations are needed to assess long-term side effects of this therapy. 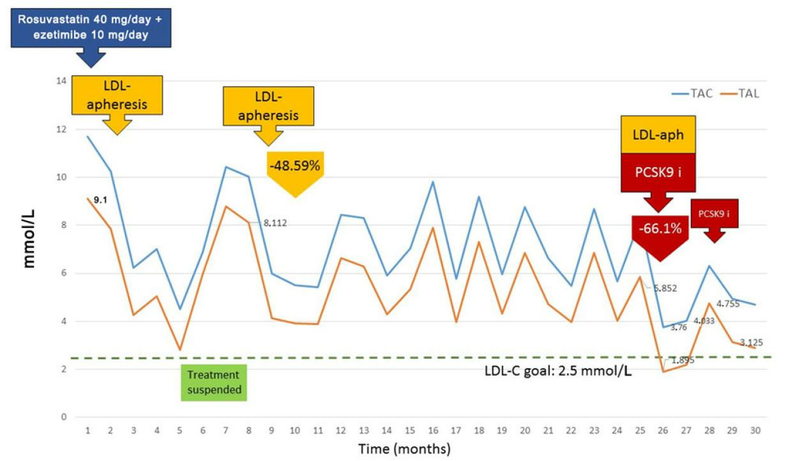 This case report highlights the difficulties of the treatment of severe heterozygous FH and proves that in some special cases LDL apheresis and PCSK9 inhibition can be combined successfully and safely resulting in extreme LDL-C reduction. Combined treatment may give hope for FH patients whose quality of life and life expectancies are limited because of the ineffective or not tolerated lipid lowering treatment. Selective LDL apheresis or PCSK9 inhibition? Sometimes we have to combine them. This research was supported by a grant from the National Research, Development and Innovation (NFKI) (OTKA 115723) and by the GINOP-2.3.2-15-2016-00005 Project. The project is co-financed by the European Union under the European Regional Development Fund. The patient gave her consent form. The work is conforming to the guiding principles of the Declaration of Helsinki, and our patient gave informed consent. 1. Gidding SS, Champagne MA, de Ferranti SD, Defesche J, Ito MK, Knowles JW, McCrindle B, Raal F, Rader D, Santos RD, Lopes-Virella M, Watts GF, Wierzbicki AS; American Heart Association Atherosclerosis, Hypertension, and Obesity in Young Committee of Council on Cardiovascular Disease in Young; Council on Cardiovascular and Stroke Nursing, Council on Functional Genomics and Translational Biology; and Council on Lifestyle and Cardiometabolic Health. The agenda for familial hypercholesterolemia: a scientific statement from the American Heart Association. Circulation 2015;132:2167-92. 2. Ahmad Z, Adams-Huet B, Chen C, Garg A. Low prevalence of mutations in known loci for autosomal dominant hypercholesterolemia in a multiethnic patient cohort. Circ Cardiovasc Genet 2012;5:666-75. 3. Catapano AL, Graham I, De Backer G, Wiklund O, Chapman MJ, Drexel H, Hoes AW, Jennings CS, Landmesser U, Pedersen TR, Reiner Ž, Riccardi G, Taskinen MR, Tokgozoglu L, Verschuren WM, Vlachopoulos C, Wood DA, Zamorano JL; Authors/Task Force Members; Additional Contributor. 2016 ESC/EAS guidelines for the management of dyslipidaemias. Eur Heart J 2016;37:2999-3058. 4. Repas TB, Tanner JR. Preventing early cardiovascular death in patients with familial hypercholesterolemia. J Am Osteopath Assoc 2014;114:99-108. 5. Cuchel M, Bruckert E, Ginsberg HN, Raal FJ, Santos RD, Hegele RA, Kuivenhoven JA, Nordestgaard BG, Descamps OS, Steinhagen-Thiessen E, Tybjærg-Hansen A, Watts GF, Averna M, Boileau C, Borén J, Catapano AL, Defesche JC, Hovingh GK, Humphries SE, Kovanen PT, Masana L, Pajukanta P, Parhofer KG, Ray KK, Stalenhoef AF, Stroes E, Taskinen MR, Wiegman A, Wiklund O, Chapman MJ; European Atherosclerosis Society Consensus Panel on Familial Hypercholesterolaemia. Homozygous familial hypercholesterolaemia: new insights and guidance for clinicians to improve detection and clinical management. A position paper from the Consensus Panel on Familial Hypercholesterolaemia of the European Atherosclerosis Society. Eur Heart J 2014;35:2146-57. 6. Page MM, Watts GF. 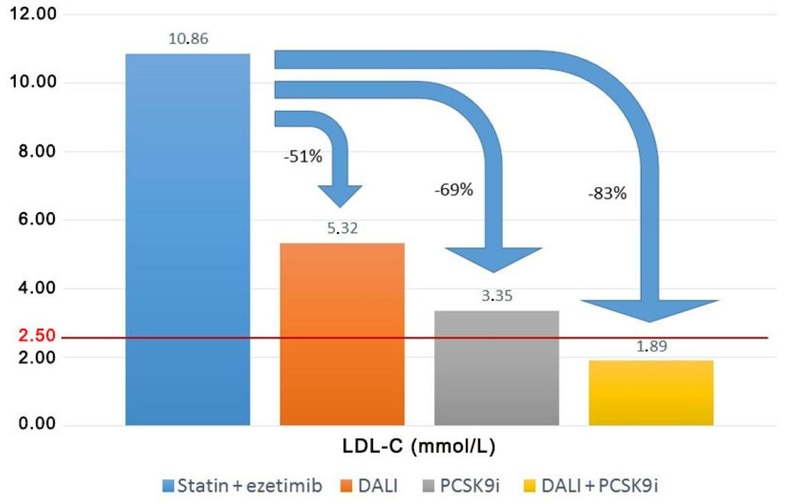 Emerging PCSK9 inhibitors for treating dyslipidaemia: buttressing the gaps in coronary prevention. Expert Opin Emerg Drugs 2015;20:299-312. 7. Bambauer R, Bambauer C, Lehmann B, Latza R, Schiel R. LDL-apheresis: technical and clinical aspects. Sci World J 2012;2012:314283. 8. Duff CJ, Scott MJ, Kirby IT, Hutchinson SE, Martin SL, Hooper NM. Antibody-mediated disruption of the interaction between PCSK9 and the low-density lipoprotein receptor. Biochem J 2009;419:577-84. 9. Chaudhary R, Garg J, Shah N, Sumner A. PCSK9 inhibitors: a new era of lipid lowering therapy. World J Cardiol 2017;9:76-91. 10. Lappegård KT, Enebakk T, Thunhaug H, Hovland A. Transition from LDL apheresis to evolocumab in heterozygous FH is equally effective in lowering LDL, without lowering HDL cholesterol. Atherosclerosis 2016;251:119-23. 11. Moriarty PM, Parhofer KG, Babirak SP, Cornier MA, Duell PB, Hohenstein B, Leebmann J, Ramlow W, Schettler V, Simha V, Steinhagen-Thiessen E, Thompson PD, Vogt A, von Stritzky B, Du Y, Manvelian G. Alirocumab in patients with heterozygous familial hypercholesterolaemia undergoing lipoprotein apheresis: the ODYSSEY ESCAPE trial. Eur Heart J 2016;37:3588-95. 12. Kroon AA, van't Hof MA, Demacker PN, Stalenhoef AF. The rebound of lipoproteins after LDL-apheresis. Kinetics and estimation of mean lipoprotein levels. Atherosclerosis 2000;152:519-26. 13. Yokoyama S, Hayashi R, Satani M, Yamamoto A. Selective removal of low density lipoprotein by plasmapheresis in familial hypercholesterolemia. Arteriosclerosis 1985;5:613-22. 14. Emerging Risk Factors Collaboration, Erqou S, Kaptoge S, Perry PL, Di Angelantonio E, Thompson A, White IR, Marcovina SM, Collins R, Thompson SG, Danesh J. Lipoprotein(a) concentration and the risk of coronary heart disease, stroke, and nonvascular mortality. JAMA 2009;302:412-23. 15. Raal F, Scott R, Somaratne R, Bridges I, Li G, Wasserman SM, Stein EA. Low-density lipoprotein cholesterol-lowering effects of AMG 145, a monoclonal antibody to proprotein convertase subtilisin/kexin type 9 serine protease in patients with heterozygous familial hypercholesterolemia: the Reduction of LDL-C with PCSK9 Inhibition in Heterozygous Familial Hypercholesterolemia Disorder (RUTHERFORD) randomized trial. Circulation 2012;126:2408-17. 16. Bosch T, Gahr S, Belschner U, Schaefer C, Lennertz A, Rammo J; DALI Study Group. Direct adsorption of low-density lipoprotein by DALI-LDL-apheresis: results of a prospective long-term multicenter follow-up covering 12,291 sessions. Ther Apher Dial 2006;10:210-8. 17. Mabuchi H, Koizumi J, Shimizu M, Kajinami K, Miyamoto S, Ueda K, Takegoshi T. Long-term efficacy of low-density lipoprotein apheresis on coronary heart disease in familial hypercholesterolemia. Hokuriku-FH-LDL-Apheresis Study Group. Am J Cardiol 1998;82:1489-95. 18. Mellwig KP, Pulawski E, Horstkotte D, van Buuren F. Lipid apheresis: oxidative stress, rheology, and vasodilatation. Clin Res Cardiol Suppl 2012;7:45-9.